Buffalo Sauce. It’s not just for wings and dips any more! This pizza has the best of the wing experience in each bite. 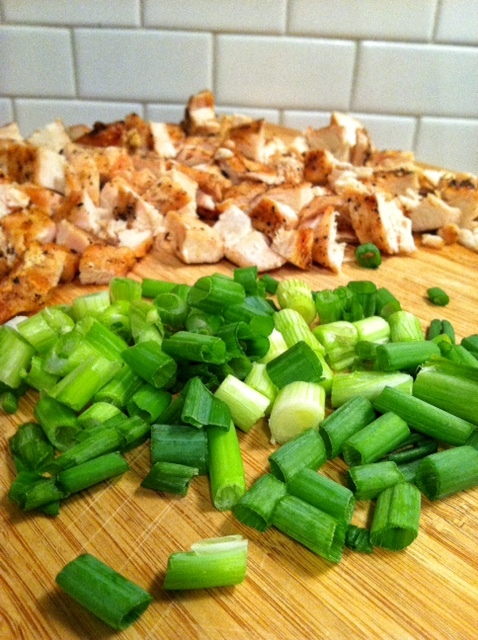 Add bread, add cheese, replace celery with green onion. Then prepare to excite your taste buds. For you local readers, my favorite wing sauce comes from McDougal’s Chicken. 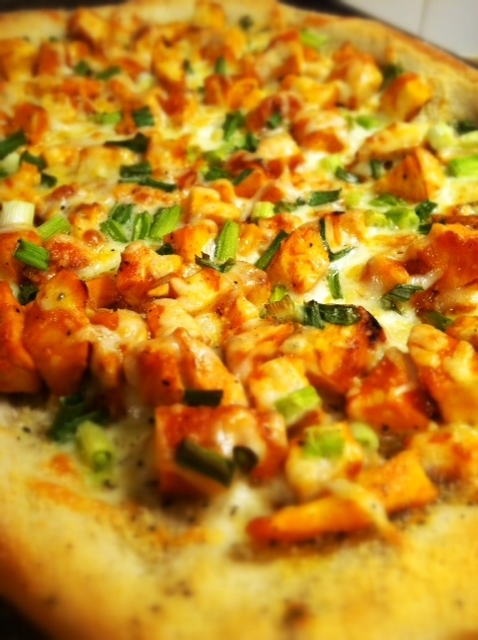 McDougal’s has lots of different delicious sauces but the one I used for this pizza is called Gold. 8 sides of gold actually (or 1/2 a cup) . 7 for the pizza and 1 for dipping the crust. They should sell this sauce by the bottle because I know what you’re thinking. Am I really supposed to go in this restaurant and order 8 sides of gold sauce to go? It seems like it would be embarrassing but it isn’t really. Actually that’s a lie. I am not sure since I have ever actually bought it myself. By the way. If you haven’t eaten here you really must go. Their food is so fresh. Their chicken is well seasoned and perfectly crispy. They don’t have freezers and they make their french fries fresh every day. Which brings me to their fries. They are so good. Hopefully they have won awards for them because the awards would be well deserved. They have great beers on tap too. And get this, at the end of the meal….you get free ice cream. I don’t know why you’re still reading this. You should be at McDougal’s. Marinate chicken in olive oil, salt and pepper. Return chicken to the fridge to marinate. Heat grill to medium-high heat. Grill chicken for 4-5 minutes. Turn over and reduce grill to medium-low. Grill for 4-5 minutes longer or until chicken is cooked through but still juicy. Let chicken rest on a plate covered in foil until it is cool enough to handle. Meanwhile, spread the dough onto a cookie sheet lined with parchment paper. Bake for 8 minutes and remove. 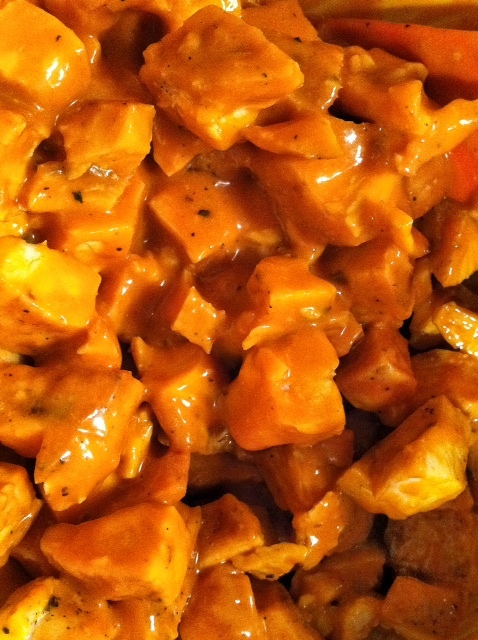 Cut chicken into small cubes. In a bowl, toss the chicken with the wing sauce. Then spread the chicken onto the partially baked dough. 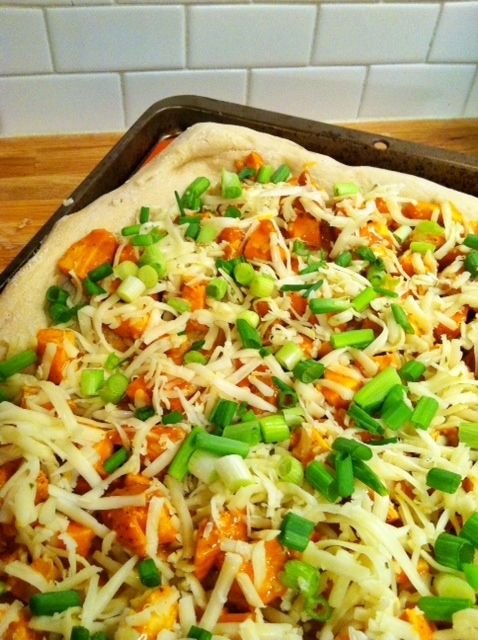 Next, top with cheese and green onion. Bake on 375 for 15 minutes or until cheese is melted and bubbling. Remove pizza from the oven and set oven to broil. 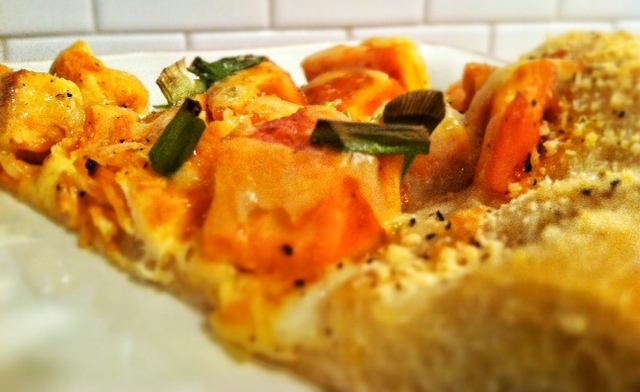 Run the cold pat of butter along the pizza crust, this will help hold the pepper and Parmesan cheese to the crust. Sprinkle the pepper (to taste) and the 3 tablespoons of freshly grated cheese around the rim of the pizza. Let the pizza rest for 5 minutes before slicing. Top with more Parm, dip in ranch or blue cheese dressing if desired. I don’t think you have a choice!